Home / Blog / Medical / Volcano Vaporizer – Is It Worth the Bucks? 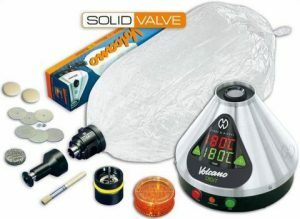 Volcano Vaporizer – Is It Worth the Bucks? Cannabis use has come a long way over the years. People have gone from smoking the herb to vaping it as a way to consume our favorite herb in the healthiest and most favorable way. After testing and reviewing a number of vaporizer’s that are on the market. The time had finally come to try the Volcano Vaporizer. I must be honest, I couldn’t contain my excitement. The Volcano’s hefty price tag may keep the average user, far away and I can understand why. Yes, its price tag has been something I have often thought about, is it really worth its price tag? As it is it can be very difficult to justify spending a large sum of money on anything related to cannabis use. Truthfully, cannabis itself can often be expensive enough! However, I do find vaporizing to be very cost-effective, far more than smoking, and the health benefits are also impossible to deny. Whether it’s the Classic or Digit, the Volcano is simple and easy to use. The Classic uses a knob to set the temperature, and the Digital has an LCD readout with specific temperature settings. To use the device, you need to press the heat button. There are power and fan buttons (the Classic uses switches), and a heat indicator light. Next, you will have to wait for around three to five minutes before the device reaches the temperature that you want for your sessions. 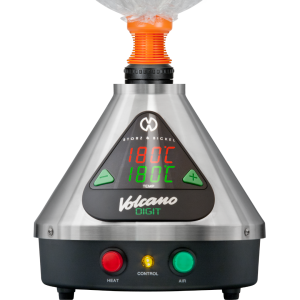 If you are using the Digital version, the Digital Volcano has an LCD display that reads the preset temperature you are currently using for your session. To adjust the temperature, you will need to press the “+” and “-” buttons to get to the right temperature. On the other hand, if you are using the Classic Volcano, you can make use of the operating dial that ranges from 1 to 9. Each number represents a specific temperature. As for most users, they usually start getting the right taste once the setting hits 6. The bag and valve system couldn’t be easier. When it’s filled, just press your lips to the mouthpiece, breath without any effort. Each hit is as smooth and tasty as the 1st. Really, I was so impressed with the quality and quantity of the vapor. Just 2 bags in and I was done! Completely medicated. The Volcano has a reputation for excellent performance, this is no secret. However, how amazing the experience was totally underrated. It’s easy to load and assemble, with vapor that is full of flavor, always cool and totally comfortable to draw. It’s also versatile enough to go through a full bowl in three or four bags at once, or just blow up enough for one super flavorful hit and save the rest for later. The Volcano vaporizer was designed with efficiency in mind from start to finish. The large heat exchanger and convection air stream deliver precisely measured on-demand heat so your herbs only cook at the temperatures you want when you want. Vapor has more cannabinoids then smoke, so with a quality device that is well-maintained, vaporizing will treat the medical cannabis patient with more of the essential cannabinoids then smoking ever could. If you are smoking cannabis regularly for health reasons, I strongly encourage you to give vaping a try. Storz & Bickle has been working on this product for over 15 years. They certainly should be respected for having some of the highest quality vaporizers anywhere in the world. When you invest in a Volcano you are investing in a tool that will last for several years. Guaranteed to produce pure flavor and smooth hits every time. Besides its excellent performance, cleaning the Volcano is super easy and occasional, depending on how much it gets used. All you need is a glass of isopropyl alcohol. The screens in the filling chamber will need the most attention and can go for longer between cleanings if you brush out the chamber after each use. Deeper cleanings involve soaking the filling chamber parts in isopropyl alcohol, and either changing out the bag and swapping it for a new one. This vaporizer is fairly low maintenance compared to others. Your bag can last well over 3 months if cared for properly. Personally, I have had many vaporizers, each has its time and place. I have also had the experience of buying a tabletop vaporizer and being totally disappointed. The Volcano does not fail to deliver. This isn’t a brand-new company looking to capitalize on the growing cannabis industry. The Volcano can be counted on to work, and its reliability is what I love most about it. The Volcano is definitely an investment piece, but with its superb German engineering, there is no doubt that its worth its price tag. In my opinion, the Volcano is an excellent option for the medical cannabis patient or the regular cannabis connoisseur who consumes a lot of cannabis. For any enthusiast ready to commit to a healthy smoking alternative the Volcano is the right investment. You probably won’t find a better tabletop vaporizer than the Volcano today. The Volcano provides you with the ultimate vaping experience that meets both the requirements of recreational and medical users. It is also compatible with both balloon and whip methods giving you different options to enjoy. It is made of high-quality parts designed for serious vaping connoisseurs. With the Volcano, you get what you pay for.